When I first heard the rumours about Bruce Jenner’s gender transition, I didn’t believe them at all. I thought someone had come up with this fake story like other inaccurate things we hear about celebrities very often. But I was surprisingly wrong and the famous Olympic winner and reality star confirmed he has always felt like a woman and now that his kids have grown it’s time he lived his life the way he’s dreamt about it. His step daughter Kim Kardashian was one of Jenner’s first supporters and the rest of the family has been by his side too. Khloe has been the most difficult to approach as she felt betrayed by the fact that he hadn’t revealed his intentions to them. After his sensational interview to Diane Sawyer a lot of celebrities and fans have expressed their support to him. Of course negative aspects and comments couldn’t be avoided. Finally his new name has been decided and has been announced on his first interview as a female on Vanity Fair. Caitlyn Jenner is the anticipated person hidden behind Bruce all these years. As Caitlyn confesses to Bissinger she suffered a panic attack the day after undergoing 10-hour facial-feminization surgery on March 15—a procedure she believed would take 5 hours. (Bissinger reveals that Jenner has not had genital surgery.) She recalls thinking, “What did I just do? What did I just do to myself?” A counselor from the Los Angeles Gender Center came to the house so Jenner could talk to a professional, and assured her that such reactions were often induced by pain medication, and that second-guessing was human and temporary. For the Jenner children, the issue of the transition has become a non-issue. They were already aware of their father’s identity as a woman when he told them individually about the transition—Burt and Cassandra had learned from their mother roughly 20 years earlier, when they were 13 and 11; Brandon had assumed it because of the obvious physical changes he had observed; and Brody was told by his mother when he was 29. They tell Bissinger they feel both happiness for their father and inspiration at his bravery, and they all still see their dad as their dad regardless of any gender label. Brandon said he was a little taken aback when he saw Caitlyn for the first time after surgery and she pulled her top up to reveal her new breasts. “Whoa, I’m still your son,” he reminded her. She says that on the E! series she will focus on ways of lowering the rates of suicide and attempted suicide in the transgender community, among other issues. “I’m not doing this to be interesting. I’m doing this to live,” Jenner tells Bissinger. 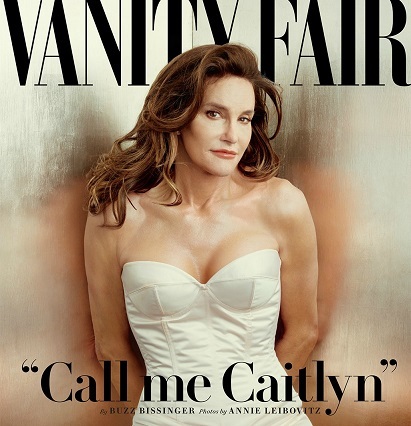 Vanity Fair’s 22-page cover story is going to be published on 9th June featuring stunning Annie Leibovitz photos of Caitlyn Jenner, formerly known as Bruce, along with revealing new details.